When I heard that a) the Merced River was about to reach its peak flow and b) Tioga Pass Road was scheduled to open on June 5 I quickly put together a one-day quick trip to Yosemite last weekend. This is a bit of a tradition for me – to get up there for at least a quick look at the spring waterfalls and to try to get over the pass as soon as possible after it opens. For a one-day up-and-back trip (amounting to a bit more than 20 hours on the road, all told) I have to start early. So, long before dawn I was up and in the car and on the road in the dark. The sun comes up – duh! – a lot earlier this time of year, so it was getting light by the time I stopped in Oakdale for a quick on-the-run Starbucks breakfast and got right back on the road. In order to arrive in the Valley by sunrise I would have had to be driving by 2:00 a.m., and that didn’t happen, but I did arrive relatively early and before the really big crowds were out and about. I spent a few minutes at my favorite first view on El Cap and Half Dome along the road just past the turnoff to Foresta and then headed down into the Valley to make my traditional first stop for a thorough drenching under Bridalveil Fall. I spent a bit more time in the Valley before realizing that the crowds were growing way beyond my comfort level. I don’t blame folks for flocking to the Valley for a scene like this: all of the waterfall in full flow, the sound of falling water everywhere, seasonal falls that aren’t usually seen, new green growth everywhere, flooded meadows, and a warm and clear spring day. But since I can come back on less crowded days, I decided that the drive over Tuolumne would be at least as special and much less crowded. As I started up 120 I soon saw significant amounts of snow, and by the time the road rose to 8000′ of so the snowpack was pretty continuous. The higher peaks appeared to be in full winter mode still, and I was surprised to see lakes like little Siesta Lake completely frozen over. I’ve been over Tioga before soon after the road opened, but the amount of snow remaining from the cold and wet May and the generally wet winter was quite impressive. Tuolumne Meadows itself was completely covered with snow, excepting the large areas flooded by the surging Tuolumne River. (The entire meadow area just upstream from the bridge by the campground entrance was completely flooded and there were only a few inches between the rushing water and the underside of the bridge. I continued on up to the pass with a goal of grabbing an early dinner at the Whoa Nelly Deli in Lee Vining. At the pass there were still several feet of snow with plow cuts being five to six feet tall in places. Tioga and Ellery Lakes were almost completely frozen over, and quite a few people were still going back-country skiing in the area. After stopping for dinner in Lee Vining (and grabbing a quick espresso at Latte Da) I headed back up the pass to shoot late afternoon and evening light before heading home. Tioga Pass Road Opening This Weekend? I’m just passing this along as an as-yet-unconfirmed rumor, but I’ve heard that Tioga Pass Road may open this weekend. Expect that many areas will still have a lot of snow and/or be quite wet, especially up high. Also, don’t expect any services or campgrounds to be open along the road in the park. June 3, 2010 Posted by gdanmitchell | Events, Sierra Nevada, Yosemite	| 120, highway, nevada, opening, pass, road, rumor, saturday, sierra, tioga, tuolumne | Comments Off on Tioga Pass Road Opening This Weekend? Memorial Weekend – Ebbetts Pass and Sonora Pass? Maybe. 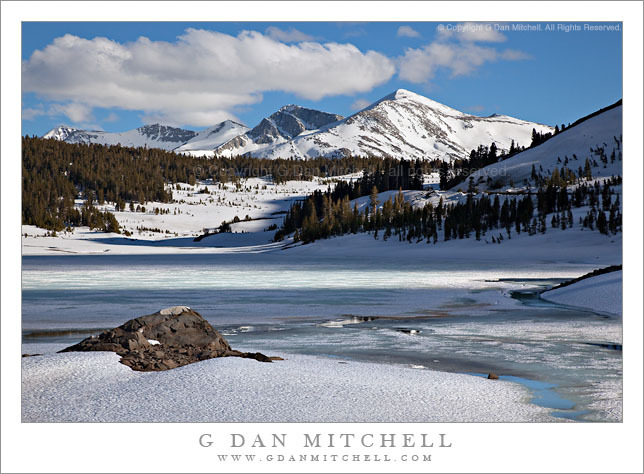 May 28, 2010 Posted by gdanmitchell | Sierra Nevada	| 108, 120, 4, conditions, ebbetts, open, pass, road, sonora, tioga | Comments Off on Memorial Weekend – Ebbetts Pass and Sonora Pass? Maybe. Memorial Weekend – Glacier Point? Yes. Tioga Pass? No. The most recent update at the Yosemite National Park web site confirms what many suspected, namely that Glacier Point Road will likely be available over the upcoming holiday weekend but that Tioga Pass will not open quite yet. The Glacier Point Road will open on Friday, May 28 at noon, conditions permitting. Expect 30-minute delays between Chinquapin and Badger Pass Sunday night through Friday afternoon (except Memorial Day). The Tioga Road will not be open for Memorial Day weekend; there is no estimated opening date. Plows have reached Tioga Pass and will now be working on widening the road. Plowing continues Monday – Saturday. Average Snow Depth is 4 to 6 feet. Plowing operation will continue today. As I have mentioned before, this has been an unusually cold and wet May. Just this morning I heard that chain requirements were up on Interstate 80 over Donner Summit. As of today, Ebbetts, Sonora, and Monitor Passes are reportedly still closed. You can be pretty certain that Tioga won’t open before them, though it frequently opens perhaps a week or so after they open. May 26, 2010 Posted by gdanmitchell | Sierra Nevada	| california, closed, conditions, day, ebbetts, glacier, holiday, memorial, monitor, national, nevada, open, park, pass, point, season, sierra, sonora, tioga, trans, weekend, Yosemite | Comments Off on Memorial Weekend – Glacier Point? Yes. Tioga Pass? No.